Colbert was invited by the chair of the House Judiciary Committee Zoe Lofgren to speak on his “vast knowledge” of farm labor issues. Apparently US Representative John Conyers felt a little uneasy by his appearance before the committee and asked the cable TV host to leave. Colbert’s reply? No. Good on you Stephen Colbert. If Conyers can’t take the truthiness, he should be the one who leaves. UPDATE – It wasn’t as dramatic as initially reported. Conyers was in on the joke, but he thought it was time to move on after Colbert made his statement. Colbert volunteered to leave if the the committee member who invited him to speak wanted him to, but she told him to stay. I’m still giving Colbert the Citizen Hero of the Day Award for one of the most awesome appearances I’ve ever seen in Congress! 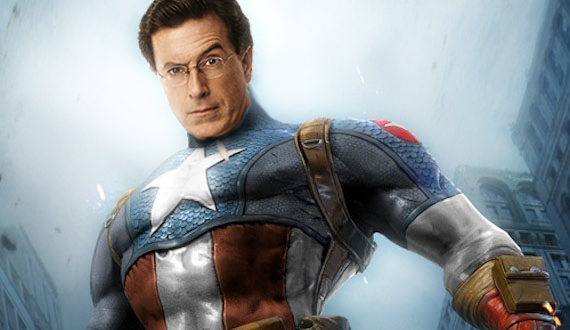 This entry was posted in News I Find Interesting and tagged captain america, captain colbert, colbert report, colbert rules, stephen colbert tells congressman to shove it, stephen colbert tv show. Bookmark the permalink.